Through PROPEL Oil Management the image above shows how the protecting properties of lubricant additives never need to reach levels that risk maximum machine protection. Through renewal, at intervals determined by remaining useful life (% RUL) testing, complete lubricant protection of machinery is achieved. Renewal does have its limits and if the lubricant additive level depletes below the critical limit and is left untreated, the lubricant becomes destroyed by a change in its molecular structure and must be replaced with new oil. This is why oil condition monitoring and trending the results is so important. As additive levels gradually drop due to consumption, minor degradation may occur according to operating conditions. At this early stage, rather than allowing the lubricant to degrade to a point where it changes its molecular structure, the lubricant is renewed by filtration, dehydration and additive replacement, returning the oil to as good as new specification (or higher). The renewed lubricant then begins the next “life cycle”, and the same scenario can repeat continuously while the lubricant is maintained using the PROPEL Oil Management system. The end result is that oxidation is controlled at very low levels, water and particle contaminants never build up to troublesome levels, and renewed oil continues to provide the maximum possible equipment protection. There is no greater protection possible than new specification oil in your equipment at all times which provides maximum reliability for your productivity schedules. 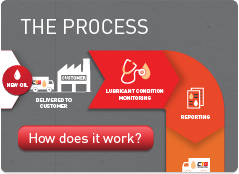 For more information on the steps involved see the PROPEL Oil Management process flow.